– Energy storage can be increased by adding battery modules. – AC power can be increased by paralleling ECOmulti modules. – Three ECOmulti modules can be configured for three phase operation. – Two ECOmulti modules can be configured for split phase operation. The growing interest in self-consumption is driven by increasing retail electricity prices and simultaneously decreasing feed in tariffs. Feed in tariffs are decreasing because it becomes increasingly difficult, and expensive, to ensure stability of the grid as more solar and wind power comes on line. Simultaneously, the retail price of electricity is increasing, to cover these same costs plus the cost to keep conventional power plants in hot standby to back-up renewable power generation in case the sun is not shining and/or the wind is not blowing. The ECOmulti inverter charger can be wall mounted, is easy to install, easy to program and easy to operate. 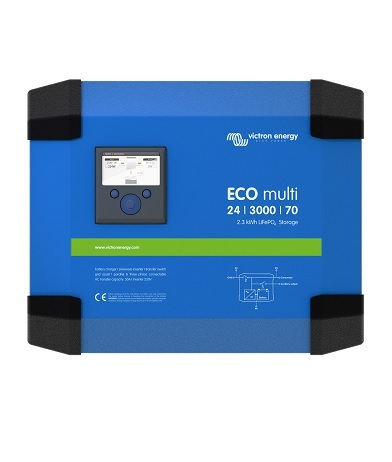 With 2.3 kWh Li-ion storage capacity and a 3 kVA bidirectional inverter, the ECOmulti reduces dependence on power from the grid. This self contained power system can be easily located anywhere in your home or business and help reduce your dependency on grid power. It comes with an Ion display which gives you real time and historic information of your energy usage. With Victron’s 5 year world wide limited warranty you can be safe in the knowledge that this inverter charger is of the highest build quality and will give you years of reliable operation.